:: Recap : Phuket :: We only live once. - Dreams are what you wake up from. Is that u in the pic?? :P SCARY!! btw, how much did a jump cost? tonnes of courage and a moment of resolution. wow. is that you or angel? wow once more before i left. you could have done that in your white overalls. hey anyone can do it! ..so treasure every single moment..
looks as if ur pants dropped upwards and your boxers were about to follow..
Wooooo...can't wait till i get to do it! The the best of life then, enjoy! 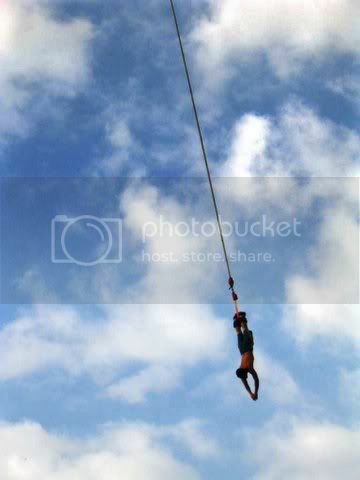 next go try the reverse bungy, also know as the catapult. mind boggling. then go try the jump nets ! cheena mama has height phobia. Interestingly, the more fear I have, the more I dare. Did I see phuket? okay. Oooh....so brave. Strangely I tried tandem skydiving, but no courage to do bungee jump.